Was just setting up to image a sunspot an hour ago. Turned on the mount, nothing, moments later, classic burning electronics smell coming from the hand controller. Tried the mount without the HC, power light comes on but no "power on click" and wont connect to the computer. All cables that came with the mount, all quadruple checked to be wired correctly. Power brick is showing 12.3v so that did not break and cause the issue. First time I heard of something like this. Hopefully all you encountered was a bad component in the HC and everything else is fine. Typical easy to died randomly components are things like capacitors. Or you could have something foreign inside the HC. Maybe you should open the HC to see it's just a few screws. Was this a relatively new copy of the mount? With my luck this would happen 1 day after the warranty expired ! The on/off switch is always the first suspect. Edited by medderx, 22 March 2019 - 03:03 PM. Hmmmm, when stuff like this happens, I often wonder if the MOUNT caused the chip to blow up OR did the BLOWN CHIP fried the mount? Fortunately, the replacement electronics of this mount are relatively affordable and easy to replace. Yeah I'm considering replacing the two controller boards because this mount has been causing me issues from the start. Hopefully I can at least get the hc replaced free of charge. Or maybe find out what IC it is that burnt up and try soldering in a new one. Update, ripped the mounts guts out, put them back in, it works now haha. 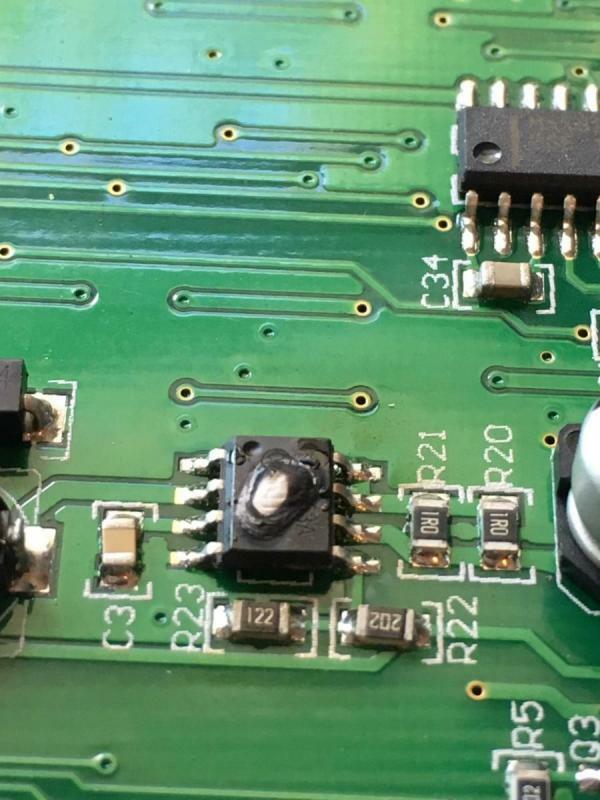 Hand controller is of course dead, so if anybody with the Go2Nova 8407+ wants to open theirs up I would love to know what IC it is that burnt up so I could try soldering in a replacement (bottom left of the board, in between two capacitors and to the right of the resistor marked R23). What power supply do you use? Is there any way it could have produced an overvoltage briefly? I encountered the same burning when plugged the controller to the port instead of the HBX by accident. Send the controller to iOptron for repair. That is my guess as well. I am using the psu that came with the mount and its reading 12.3v and when I plug it in it does not seem to spike. I have tried others but the mount is still sitting there dead. It looks like my warranty is in tact so I can send them whatever I want to be serviced. I would love to send the whole mount because I have had so many issues with tracking and guiding, but I am the one who has to cover shipping so I'm not super excited about shipping a 40+ Lbs box all the way to china and back. I thought they had you ship to their location in Woburn MA. If you've had other issues, it really is worth the money to have them give it the once over. Especially since burn out issues can easily be unrelated to the chip that burned. Sometimes it's the chip that burned that is acting like a fuse for other components that are misbehaving. If it's under warranty, and you can get them to look into all of the issues you've had, I'd ship it all. In any case, hope it all works out well for you. The blown chip is an STMicro MC34063AC, a DC-DC converter (https://www.st.com/r...t/mc34063ec.pdf). However, if it has blown up there must be a reason, and it must be found if you want to trust your mount. Maybe a short in the HBX? What sort of issues did you have? Could have been wonky power as you blew a power component. Now that could be from internal to the HC as DC-DC converters can blow but could also be due to your power brick etc. Ok so somehow the firmware got corrupted and thats why it stopped working this last time and why even the led did not turn on. Now it officially seems to be working after reinstalling all of them. Well after talking to them you are right thankfully, so I will just have to pay shipping to MA. Now I'm just trying to decide if I want to just ship the HC and boards or the whole mount, they estimate $100 round trip with their corporate volume rate. I'm starting to consider just sending it all in then selling it and getting something like a G11. Or hold onto it for another couple+ years and get a GM-1000. A g11 is not exactly an upgrade. Btw while the gm-1000 is good you should read what is involved if your plans is to image without guiding. It seems potentially another source of issues and frustration. If I where you I'd just ship in the HC first. I am not sure what exactly happened to your HC or mount. Cause usually electronic don't partially break usually it's a binary working or completely not. Especially if you actually have a blown dc-dc convertor chip. Yeah I am at least going to send in the HC. I now believe the mount is "fine", i am considering sending it all in because it only peforms well 10% of the time. My reason for wanting a g11 or gm-1000 is I use adaptive optics so the only time actual guiding is used is when the AO runs out of correcting angle which means the mount is doing a bad job of tracking, and that happens a lot. I use a polemaster too and dont settle unless I am at least within a 45 arcsec alignment so I realloy dont see why my tracking is so bad, I have talked to both iOptron and other cem60 owners to see if I am doing anything wrong but it does not seem so. I use maximdl and have been trying to get maxpoint to work because it would in theory solve my issues, but it and the mount for some reason cant agree where the mount is pointing and nobody has been able to say why. edit* also JTW Astronomy's new OGEM mount. Its still in beta but they are going to send out a few of them for people to test soon. Edited by medderx, 24 March 2019 - 06:44 PM. AO needing a mount bump is not always because the mount is doing a bad job. The cem60 is a regular mount and needs guiding to do its work. The angle of the AO vs the image scale could impact how much you can expect the AO to be able to correct for. If your scale is small and the mounts native PE is larger than the scale allows you are going to need some mount movement at some point. Since the cem60 has a -/+ 5 arc second PE spec there can be a total of 10 arc second of error in a given cycle. And the frequency of that error is not always the best. I think a g11 would be no better or even worse. As there are examples of a lot of adjustments to reduce the PE measured. Everything from work meshing to the motor shaft coupling can cause issue in the g11. Maybe your solution is to consider encoder enabled mounts. And for that there are an increasing number of choices. With my 9.25 the ao can correct up to almost exactly 30 arcseconds. It always reaches that withen an hour but more commonly a half hour. Yes incoders is an option Ihave been wanting and kinda regret not getting but an additional $1000 seemed like a lot at the time for a mount that should in theory be able to already peform well enough for my setup. Just to clarify, I'm not intending to trash the CEM60 because I like them a lot, it just seems like mine is a bit of a lemon. There is a point where you get fed up with things and just want to start from scratch. I don't think you are trashing it but I think maybe your expectations are way high. Are you saying there's no guide inputs to the mount for at least 30 minutes? Cause if that's the case it would seem it works quite well with AO. If I have it set in maxim to not send corrections to the mount until the ao angle runs out then yes it takes about a half hour. But that means that the mount has drifted 30 arc seconds, and that's with having a pretty decent polar alignment, a very picky 3 star alignment and plate solving every other image. I should add that at times it will drift off so fast that it loses the guide star and by the time I get out to recenter the object it will be out of frame. A friend has exact same scope/camera setup but a CGX and he will go the whole night without the mount having to make a single correction and only plate solved right before starting the image sequence. In what direction is the error that causes the AO to run out of range? Could it be due to polar alignment error? If you are off 2 arcminutes in polar alignment, you can get 30" of accumulated error in 1 hour of time. And that is very good polar alignment. Not to mention king vs sidereal.